Latin was one of my favorite studies in high school. It seems odd, in this day of sorely challenged school curriculae, but believe it or not, in those days – the 1960’s – Highland Park, Michigan had one of the best school systems in the whole country. This was before the disintegration of the city’s tax base with the decline of the automotive industry that was headquatered there -the city’s core of support. In those days many of us took Latin, and many of us who took Latin truly loved the subject – due, in no small part, to our teacher – the dear, genteel Mrs. Banton. 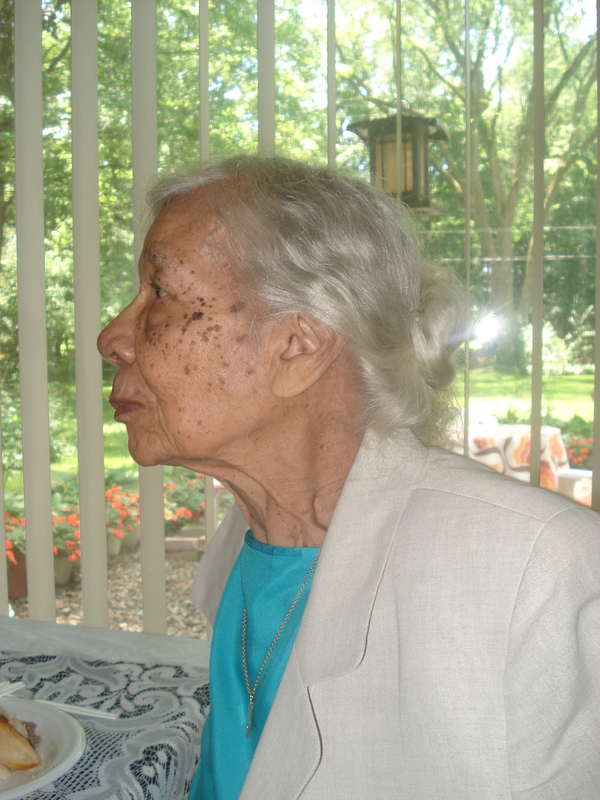 She looked a little like Rosa Parks, and though she was surely younger then than I am now, she seemed really old to us, even back then – for she joined none of the other teachers in their late-60’s’ efforts to be hip, slick, cool or even “relevant”. She wore her hair in a wavy chignon at the nape of her neck; loose wisps of hair a grey halo ’round her head. Back in those days when we girl students desperately fought and marched for the right to wear pants and mini-skirts to school, she unwavering stuck to skirts well past her knees and sensible oxfords. But she never ridiculed or scolded us for our 60’s protests; she merely admonished us to “think” and to not forget our studies. In her classroom at Highland Park High, she would tip-toe ‘round the room, glancing at papers, checking pronunciation; the tips of her fingers together as if in prayer, holding a tiny baton for the blackboard. She had a slight overbite that gave her a tiny, charming lisp, and one could tell she’d been a beauty in her youth – though to think of her as carefree and young was inconceivable, as proper and mannered as she always seemed to be. She spoke in a singsong voice in an absent-minded kind of way that disguised her utter attention to every move that we made and every error in person, time and place. 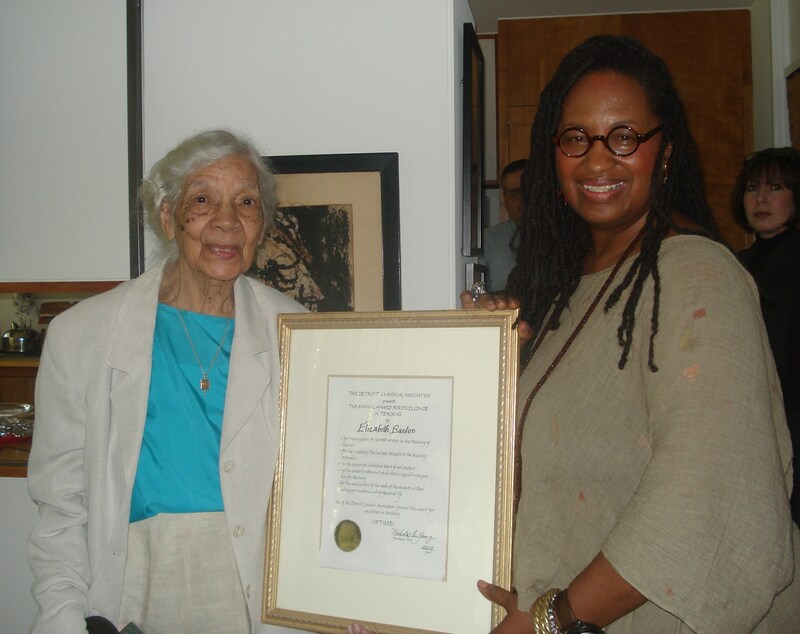 I learned, many years later, that she was actually a renowned scholar in Latin and the Classics, one of the few African-Americans to be degree’d in such studies in the United States. Eventually, after marriage, she made her way North, for in the segregated South, there were few “Colored” schools that could hire her to teach such subjects to Black children – and none of the Whites schools would, of course. When I grew older, I looked back and understood that our raucous Black student protests during high school – against the prejudice and discrimination that afflicted our generation, too – neither offended, nor distracted her – she had probably faced more challenges in a single episode of her younger life in the days of segregation, than we – middle class children of the integrated North – could ever conceive of, in our agitated outbursts of dissent. Just to attend school or teach, in the days in which she started her career, doubtless took an immensity of courage that was rarely required even on our most boisterous picket lines and marches. She was fervent in her love of language, and her syllabus was tailor-made for the most useful application of Latin possible – she was less concerned with merely teaching us the phrases of another time, than to cultivate a love of language, to provide a cornerstone in the construction of vocabulary. She supported my love of writing, she gave an intensity and direction to my obsession with words, and instilled in me the curiosity to trace chains of words through centuries, to their varied and often unexpected origins. In the spring of 2005, it had been more than 40 years since I’d seen her, when I was in the Fisher Building and turned around and there she was, walking on the arm of her son. She was 92 (!) and quite frail, but there was no mistaking Mrs. Banton. Her hair – now white – was still in it’s prim, wispy bun and she spoke with the same whispery overbite. Yup, I gulped, she knew me, she remembered well – I left school a year before graduation, much too young to be large with child, never to return. Even so, I told her, I’d had my child, and in fact eventually had two, but I was writing still. She was proud and glad to know that her lessons had come to some good use, that I had ended up a writer after all, thanks in part to her gentle exhortations of person, place and stories of Rome, centuries ago. Her son, middle-aged like me, stood quietly by her side as we chatted; it was time to say goodbye and as we parted she turned to introduce us. Much to my surprise she leaned close to him and began to speak to him by signing, their fingers flew in the language of the deaf and he looked at me and smiled. My goodness! In a 60 year career she had shared her love of language with countless children, yet she spoke in silence to her child. Oh, how fortunate was I to have been her student; how fortunate was she to have mastered another, soundless tongue. How blessed was her son to have a mother with such a love of words, who was gifted enough to make them fly from her hands to him, like doves. 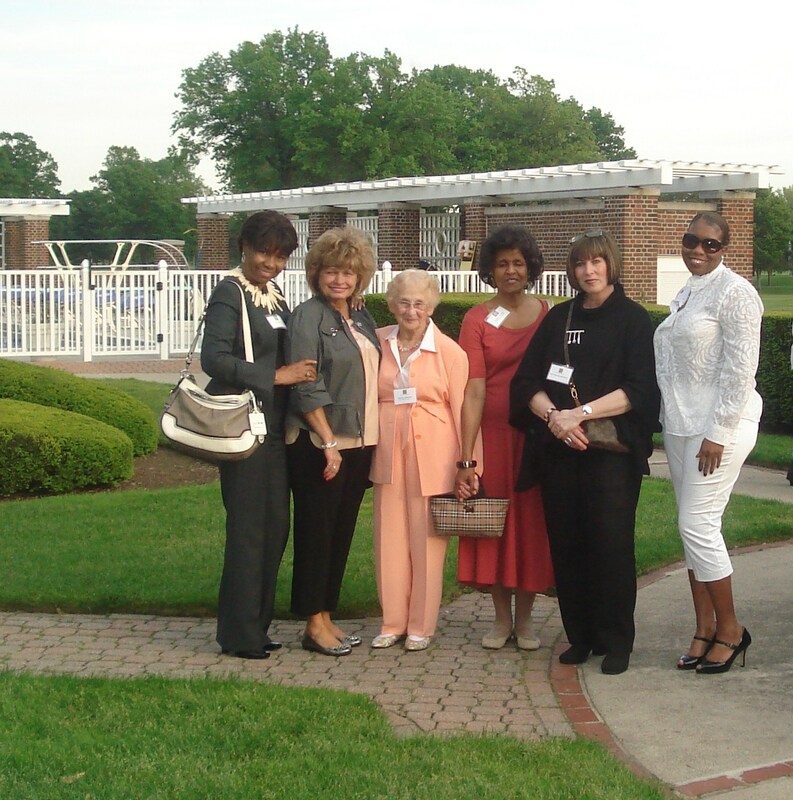 It was a lovely, warm evening in Detroit, in May, 2010, spent at a book signing at the Palmer Park Golf Club, a verdant enclave in the midst of the city. I met a delightful group of ladies, including a wonderfully lively little octagengarian named Norma Goldman (center, in photo above), who delighted us with her stories. When I asked what she did, or rather, had done, for a living, among her numerous avocations was her decades long career as a teacher of Latin. This revelation gave rise to my mentioning my own beloved high-school Latin teacher, Mrs. Elizabeth Banton. In the serendipidous, small world, three-degrees-of-separation Detroit way, it happened that the lovely, white-haired woman whom had just met – Mrs. Goldman – was a best friend of my former teacher – Mrs. Banton – whom, it turned out, was alive and well and living in the area. 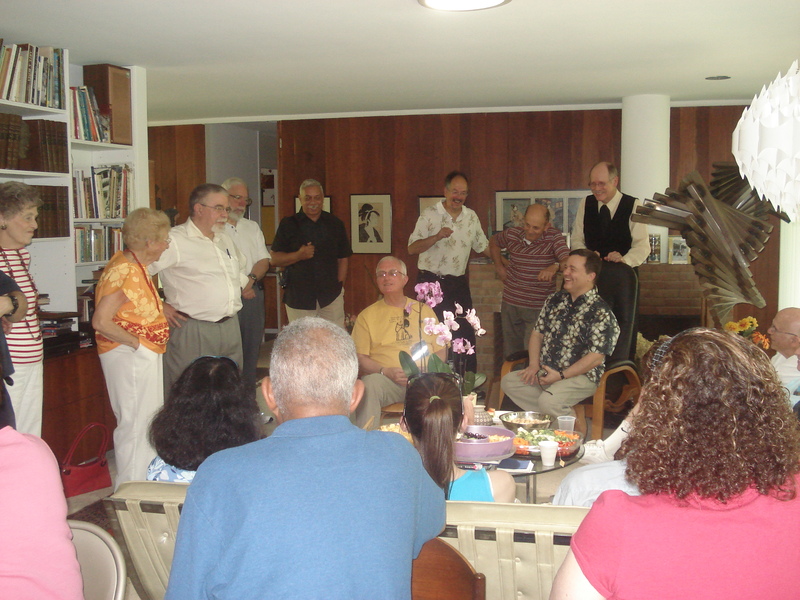 Mrs. Goldman invited me to an annual potluck in June 2010, celebrating Detroit area Latin/Classics teachers, where, as it turned out, Mrs Banton was to be the honoree, for her years of service in the teaching of Latin and the Classics. She asked me to come and read this story that I had written about Mrs. Banton at the event, and I did. Mrs. Banton was astonished and tickled that this prodigal student had returned to her life, to say thanks and to acknowledge the role that she played in my life. 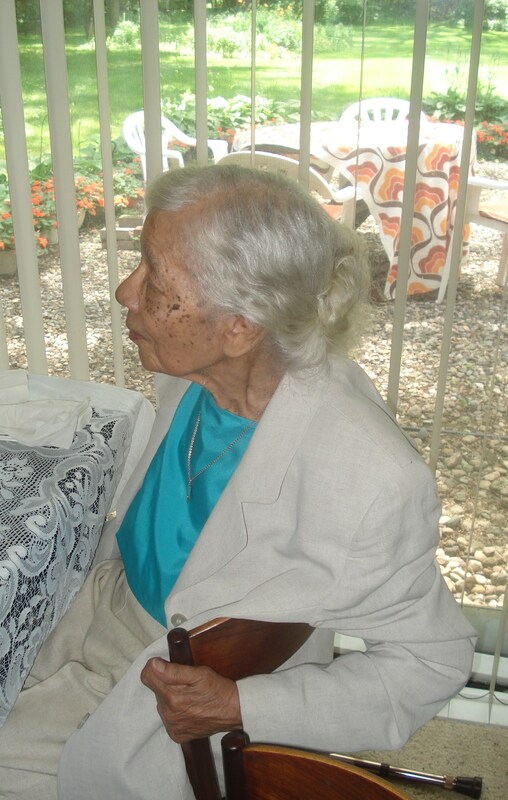 At the time of this event, in 2010, Mrs. Banton was still spry, bright and lovely 96 years old. And yes, she still remembered me. 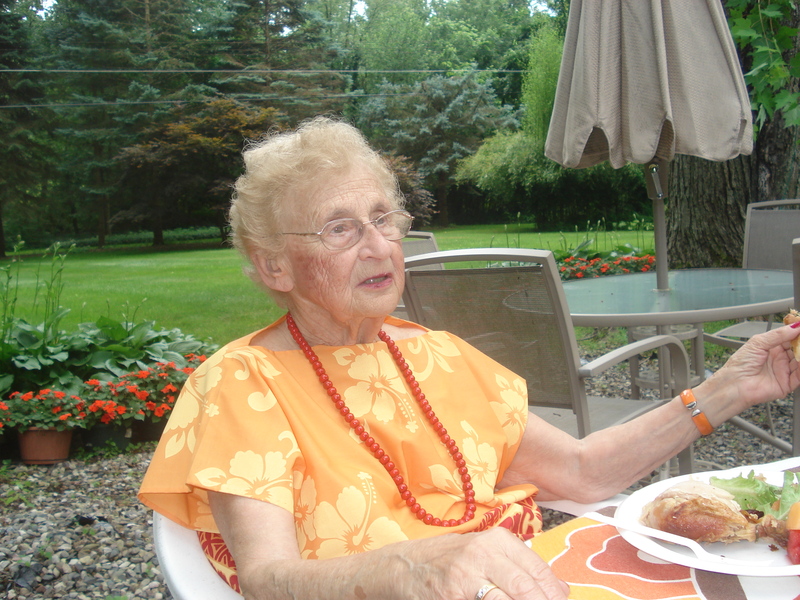 Mrs. Norma Goldman, one of the great women I have encountered in my life, passed away in 2011. 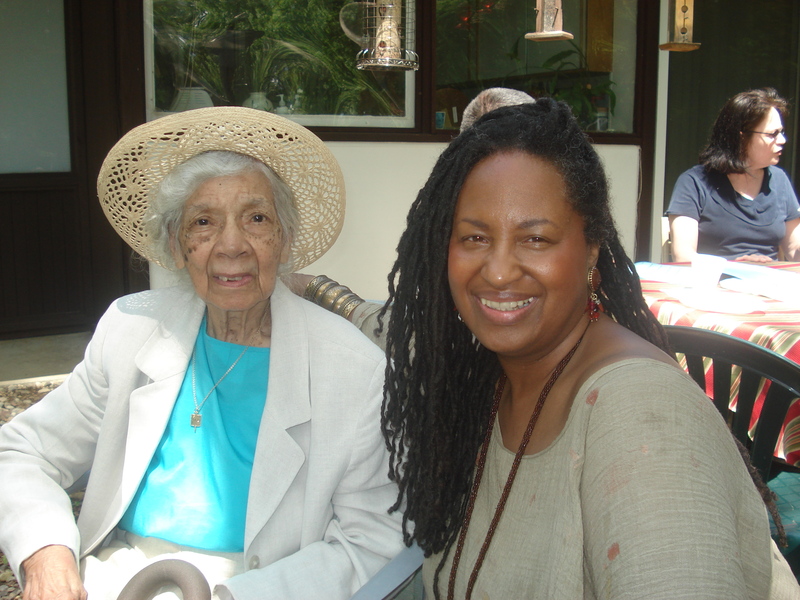 I have not heard about my dear teacher Mrs. Banton, since but I trust that she is doing well – here, or in the hereafter. Categories: I'm Grown in Detroit | Permalink. What a lovely tribute to Elizabeth. That is a perfect description of her, and although she does not use a computer, her other son Clarence,jr. has a computer and I will find out his e-mail address, or I can print out your article and mail it to her. Teachers rarely have a chance to find out how their teaching affects their students. Your tribute to her and your eloquence in expressing your indebtedness to her for your ability as a writer provide very tangible evidence of just what you are saying in the article. What an article! I had just mentioned Mrs. Banton to a former classmate. Thanks for putting this on Facebook as well. Mrs. Banton was all that you said and you said it so well. I remember that the week of my graduation (1973), she had me and a couple of other students over to her house for dinner. This had never happened before. A student being asked to a teacher’s house for dinner. She deserves the tribute that you gave her and more. It is unsung heroes like Mrs. Banton that make this world a better place. I graduated from HPHS in 1954 and when I graduated from Wayne State I returned to HP to teach. My husband, Don Kaiser, taught history at HPHS and at HPCC. I met Mark Booth at Ford School when I was the librarian there-(I later went to HPCC as Head Librarian.) I was fortunate when he wrote me on Facebook. I never took Latin but I was acquainted with Elizabeth Banton as a colleague. Your tribute was such a loving portrait of a remarkable woman and educator. You are indeed a marvelous writer and I hope you are pursuing it professionally. I am so glad that Mark sent it to me. P.S. I’m sure we know people in common from HP. Way to go Marsha. Loved your article. You are such a good writer. I love your, concise descriptive style. See you Saturday for writing time. Again, I am moved to tears by your writing! What a delight to have your words fly in our town! Thank you Suzanne and Pauline (2 of my writing compantions); you help me with my “voice”. Thank you Betty for taking the time to write your marvelous words and that bit of history. I hope you find other articles on this site that you enjoy. Thank you for both the words and images that allowed us to share in what had to have been a heart warming event. Isn’t it marvelous that you were able to share how you felt with her. That was a gift for both of you! You made me wish that I could somehow contact Sylvia Holcolm, my favorite high school English teacher. I think a good teacher makes you feel that you are important to them. and that, therefore, you have value. At that age, it also makes you realize that you just might have a meaningful future, as well. Thanks Marti; yes, come to think of it, more than anything I felt that my talent and worth were reflected in her eyes. I was saving your piece for a quiet moment, maybe later in the week, but I just couldn’t resist, and dove into your memories tonight. Thoroughly enjoyable as you salute Detroit, teachers, pg young women who go on to make good, Latin, growing old with energy, different generations, diverse languages, and more that I am surely missing — all wrapped in beautiful, even suspenseful, writing. Thank you for sharing, and I intend to spread this link around. There is no higher praise that I could receive, as far as I’m concerned – and coming from you, a gifted writer yourself. I thankyou. Great story! I enjoyed it very much. I regret having never met this wonderful lady during my time at school. But ah, you carry her work forward! Today, I heard a story on NPR about being thankful for a special teacher. Mrs. Banton immediately came to mind. I have thought of her frequently. I took Advanced English and Latin from her. She had studied Ghandi and Martin Luther King Jr. She would walk into a fight. She would separate the two boys fighting. She would wade in say, “Gentleman, Gentleman.” Surprisingly, they would stop fighting. She embodied non-violence. She told me to never lose my idealism. I never have. I admired her and wanted to be like her. Sometimes,when faced with difficulties, I would wonder what she would do. She is far more courageous than I could ever be. I still remember the sound of her voice and her lovely accent. I graduated in 1969. Here we are forty-two years later. She is still my hero. I am thankful to her, I am grateful for the influence that she had on my life. I enjoyed your story about her. I felt like I got to spend a few minutes with her. Yes, HP was a great place to go to school.